We've put together an incredible birthday package that is high-value and all-inclusive. Save yourself the hassle, and let us do the work. You'll walk away with a unique and memorable experience for all. Is it your birthday? Great- you play free, so plan to celebrate your special day with us! We do it all by offering our private party room, catering services, and the Escape Game experience! Our games are recommended for anyone older than 7 and for groups of 16 people. For players under the age of 18, we require at least 1 adult signature on the pre-game waiver. We would be happy to create a custom package for your group. Our prices are from $350 + HST. 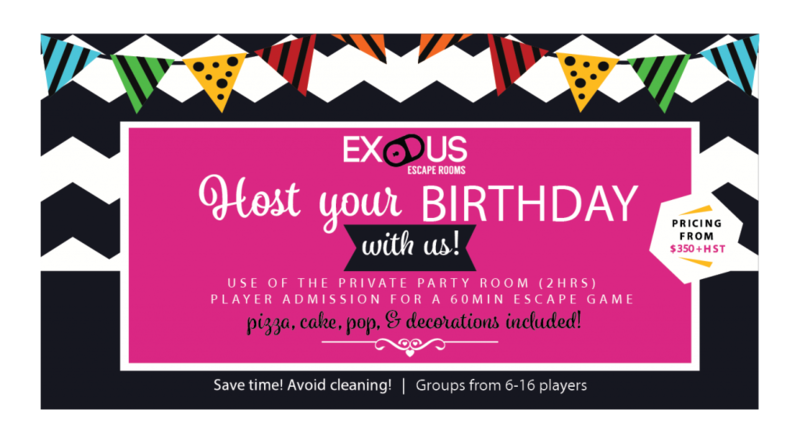 Exodus will schedule private birthday parties based on your schedule. Just let us know. Pizza, Pop, Cake, and Decorations!